I was so struck by this tiny miniature,,,the precision and the winding colors in the star. So much beauty in a teeny tiny package. On the last day of the show, they reveal the People's Choice for small and large quilts. Pat Morrow's stunning wool village won the People's Choice for large quilts. It is pictured in Part Two of these posts. lots of pretty quilts - thanks for sharing!! Thank you for the wonderful virtual quilt show. 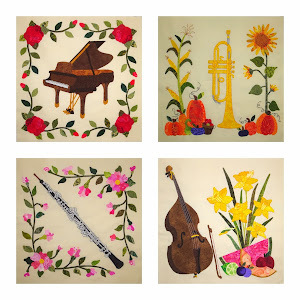 Lots of amazing pieces from some very talented quilters. Your effort is much appreciated. Gorgeous quilts. Thank you for sharing. Just finished the fifth blog post of this show. 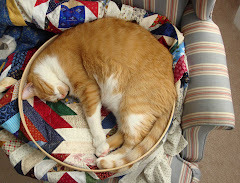 You do a great job with the photographing of the quilts. I enjoyed it.... and shared some with Michele Hill the inspiration to several of those quilts. thank you for sharing the eye candy, we don't seem to get a lot of quilt exhibitions in subtropical Far North Queensland, Australia. I especially loved the zebra face one. "Contentment" gets some swag at Sauder Village!